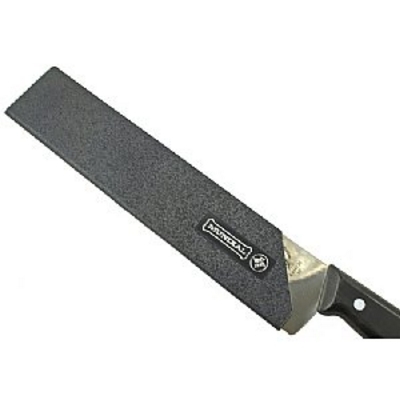 The Mundial brand blade guard is an economical way to safely protect the edge of your knife during storage. Felt lined guard slides easily over the blade. Protect the edge of your knife when storing in a drawer or carrying in a case. Reduce accidental cuts when reaching for a knife. Blade guards are sold as individual units in different sizes. Measure the length and width of the blade you want to protect and order the appropriate size. Note: On some wider blades the guard will not cover the whole blade. When measuring the width of curved blade knives, please take into consideration the curve of the blade. Curved bladed knives will require extra wide guards, or the tip of the blade may be exposed out of the guard. On some knives the design of the knife or bolster may prevent the guard from covering the last quarter inch of the edge near the handle. How to read the guard measurements: The first number is the length of the guard and the second number is the width of the guard.